Note: This product was created by me, with use of a Crick Software product. It requires the app Clicker Books to use. Clicker Books is only available for iPad and is a paid product. Please do not purchase if you do not (or are not planning on purchasing) Clicker Books. 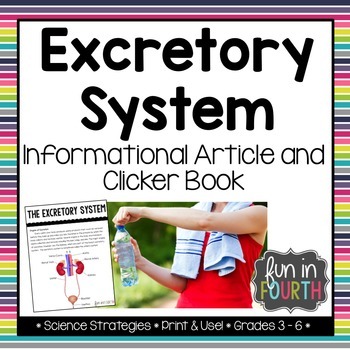 Click here to get more information on Clicker Books. This file is also available as a printable article only. Click here if interested. 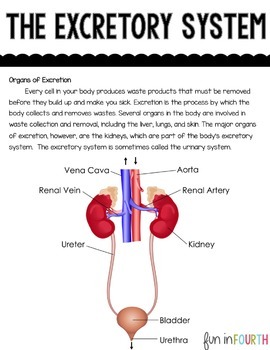 In this article, students will learn all about the excretory system: the liver, kidneys, importance of hydration and more. You will get a 4 page article that requires no prep and is ready to go! It contains several full color images and diagrams to help support the text. There is space between the lines for students to jot notes and interact with the text if you desire. You are also downloading a 7 page Clicker Books version of the article. 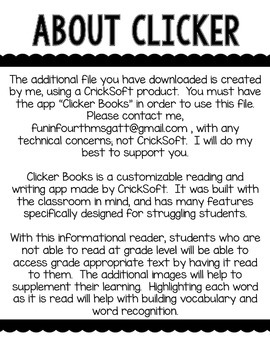 Clicker Books is a customizable reading and writing app made by CrickSoft. It was built with the classroom in mind, and has many features specifically designed for struggling students. With this informational reader, students who are not able to read at grade level will be able to access grade appropriate text by having it read to them. The additional images will help to supplement their learning. Highlighting each word as it is read will help with building vocabulary and word recognition. Produced with permission of Crick Software, Inc.
Want more Body Systems articles? Or, get the bundle and save 20%! I appreciate your feedback! It gives me the information I need to continue creating high-quality products for your classroom! Feel free to e-mail me with any questions about this product at: funinfourthmsgatt@gmail.com and connect with me for classroom ideas & resources, freebies, and more product details at any or all of the links below!